Read Inside Cheerleading: The Most Dangerous Sport for Women by Dr. Edgar Romo to learn more about Romo Chiropractic of Modesto and our Chiropractic office in Modesto, CA. On a warm evening in 2003, Krista Parks was beaming with pride on a football field as a cheerleader at the University of Memphis. This was her moment – her squad was practicing for the national cheer championship in Orlando, Fla. Parks was to pull off an ambitious stunt – a high front flip in the air from the top of the pyramid, landing in the arms of her squad; instead, she lost her momentum and fell head first onto a 2-inch foam mat on concrete. The result: a broken neck, a blood clot in her brain and multiple fractures. Following the incident Parks underwent three surgeries, had to wear a neck brace, and then had to deal with years of physical therapy. A permanent shunt was placed in her spine to help drain fluid from her brain because her body can no longer do it. Today, she is also dealing with life-altering changes to her cognitive abilities – loss of memory, delayed comprehension and mental fogginess. And one of the things that can make it much safer – and healing faster – is consistent chiropractic care, she said. Since she started chiropractic care for her catastrophic injuries a few years ago, Parks said her pain level has decreased to the point where she can function much better on a daily basis. In a 2009 report, the National Center for Catastrophic Sports Injury (NCCSI) Research at the University of North Carolina at Chapel Hill, N.C., declared cheerleading the “most dangerous female sport in the United States” based on injury data they obtained from 1982-2008 that showed approximately two-thirds of severe school sports injuries over the past 25 years were from cheerleading. The reason is quite straightforward: At many high schools and colleges, and at the professional level, it is no longer enough for the cheer squad to simply coordinate chants and perform dance routines. Today, highly demanding acrobatic moves have become the norm, experts say. National competitions have upped the ante, by fomenting a “can you top this” attitude that pushes kids to do even riskier stunts. As a result, their jumps, splits, and acrobatic tumbles have become to cheerleaders what the blindside hits, collisions and flying tackles are to the football players out on the field. The jolts to their bodies are serious. But while injuries have made cheerleading the most dangerous sport for young American women, experts say that the risk and severity of injury can be kept to a minimum with chiropractic care. Chiropractors identify injuries early and properly manage them before they progress to something more serious, which is the key to people like Parks who has had to ensure her body heals properly. Krista Parks (in photo) was a University of Memphis cheerleader in 2003 when an ambitious front-flip maneuver during practice turned disastrous, ending her career and necessitating years of rehabilitation.With cheerleading calling for ever-higher degrees of athleticism, chiropractors say they are able to provide a unique understanding of the rigorous training and physical toll that the sport has on the body, unlike any other type of physician. Some of the most common injuries for cheerleading these days include overuse of the shoulders, wrists, and elbows, neck injuries, head traumas, fractured wrists and dislocations. These tend to happen from falls onto hard gym floors and tracks. Other factors such as the length of the cheerleading season, which lasts from the fall to spring also sets up much more potential for nagging injuries that are never fully allowed to heal, said Dr. Goninan. “Like all athletes there has to be some down time to in order to allow the body to recover,” he said. The Washington Redskins cheerleaders are supporting the nonprofit Foundation for Chiropractic Progress, sharing their positive experiences with chiropractic care and how it helps keep them at the top of their game.Dr. Goninan recommends all cheerleaders have their spines checked and their muscle strength tested at least once a week during the season to detect and prevent all types of lingering injuries. “To perform some of the athletic gymnastic moves required in cheerleading, it is absolutely essential that all muscles be firing on all cylinders,” said Goninan. Dr. Greenstein’s clients have been so pleased with the results of their care they recently assumed the role of being the latest ambassadors for chiropractic care by teaming up with the Foundation for Chiropractic Progress to promote chiropractic and the benefits of a healthy lifestyle. Amanda Mitchell, who has been in the sport since high school and a professional for the last two seasons on the Redskins cheer squad, credits chiropractic care for making it possible for her to perform through a 16-game season. In fact, without it, she says, she wouldn’t have made it through her first season. Mitchell said her flexibility and pain from subtle injuries have dramatically been reduced through chiropractic care. “People don’t view it as a competitive sport, but you have to try out every single year in this industry and its extremely cutthroat,” she said. Both Medina and Mitchell have also learned a lot of useful tips to avoid injuries. Medina said that regular exercise outside of practice and good eating habits are at least as important as warm-ups and cool-downs at practice and events. And Mitchell pointed out that while parents may not be able to control what happens at practice or a game, they can take control in the kitchen. “It all begins with a healthy diet,” said Mitchell. “I believe staying in shape is 80 percent diet, 10 percent genetic and 10 percent workout.” She believes part of the reason why she has avoided serious injury is because she’s learned to eat the right foods at the right time of day. Training, proper warm-up and cool down, as well as practice are important too, of course, but she strongly believes that it’s her diet that has been the ultimate factor. On a typical day, Mitchell said she has five small meals of between 200 and 300 calories each. Breakfast often includes oatmeal and egg whites. Her morning snack is a protein shake or protein bar. Lunch is a spinach or broccoli salad, often mixed with chicken. Afternoon snack is again a shake or protein bar, usually with some almonds for “finger food.” Fish is her favorite for dinner. 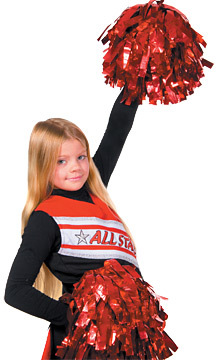 Dr. Greenstein also recommends cheerleaders also do dynamic warm-ups – a warm up activity that includes upper body and lower body movements to warm up the muscles and dynamic stretches for better flexibility two hours prior to an event. He also recommends if a cheerleader is getting their technique wrong, its best to adjust it to prevent any other injuries. 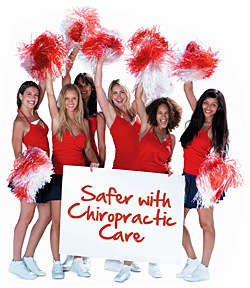 If a cheerleader does end up getting hurt, he said, with chiropractic care there are always plenty of solutions. “The goal is to decrease pain that can be done naturally through chiropractic care and also improving overall function, which also is a huge component of what chiropractors do,” he said. Make sure your athlete’s team has rehearsed their catastrophic emergency plan before going out on the field. Obtain a pre-participation physical for your athlete to ensure they are healthy and prepared. Look for a mature, qualified coach that knows proper technique, progressions and spotting. Find a safe environment to practice and learn. Have automatic external defibrillators available at all time in case of an emergency. Report injuries to www.cheerinjuryreport.com for research purposes. Make sure you are aware of head injuries and the signs of concussion. Keep your athlete hydrated and make sure they know how they prevent heat illness. Only allow your athlete to return to play after injury when released by a qualified health professional. Check that the coach has had a background check. Source: The National Cheerleading Safety Foundation. For more information, visitwww.nationalcheersafety.com.